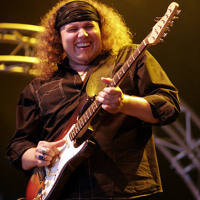 For listening only, my hero at bluesrock, njoy this gitar master! My name is Julian. I was born on a river in 1970 in a small town in the center of the Netherlands called Beneden-Leeuwen. Since I was born I have been a restless person, This is something that I still have today. Only until I was 6 years old I knew where this was coming from; I saw this movie called the Toronto rock 'n roll festival. There I saw Jerry lee lewis and Chuck Berry. From that day on I knew what I was going to be In my life I wanted to make music. I was hooked as a little child on what I felt when I saw this movie, it was Jerry lees immense energy and maybe more important for my future I saw Chuck's guitar.